Now that school is back in session, you’ve probably noticed the roads have gotten busier, along with the brief congestion around schools during the drop-off/pick-up times of the day. If you get frustrated with driving your kids to school try walking! Walking to school is a great alternative to driving and is a physical activity the whole family can enjoy. Bellevue School District Elementary Schools have a one mile walk path boundary, which means if you live in that buffer, bus transportation is not provided. So if bussing to school is not an option, set goals to walk to school instead. This link can tell you how far away from the school you live. If you feel there are issues walking to school, the Bellevue School District has a Safe Walk Committee that allows you to express concerns. If you live within one mile of the school, walk! International Walk-to-School Day is Wednesday, October 7th and the city is working with Bellevue Elementary School PTSAs to put on fun events. This day will be full of excitement, giveaways, and even an appearance by Pedbee! At least 7 elementary schools will be participating this year. Pedbee is excited for Walk-to-School Day! Crossing the street seems to be a relatively simple task, yet not everyone completely understands the logistics of crossing a road. So while there are still misconceptions on “why the chicken crossed the road,” let’s go over more mistaken beliefs regarding crosswalks. Myth: At traffic lights, you can still start to walk on the crosswalk even if the timer starts counting down and/or the red hand starts to flash. Truth: You should not begin to cross if the red hand is flashing or the timer comes on. Begin to walk on the crosswalk only when the white pedestrian symbol comes up, and after you “stopped, looked, and listened” for any nearby traffic. You can start crossing the street when the pedestrian symbol appears. Why did the chicken girl cross the road? To demonstrate how to safely cross a crosswalk! If you are on the crosswalk when the red hand begins to countdown, continue to cross. If you have not begun crossing, you must wait until the pedestrian symbol lights up again. These rulers were given to school student in Northeast Bellevue in conjunction with a pedestrian improvement project. 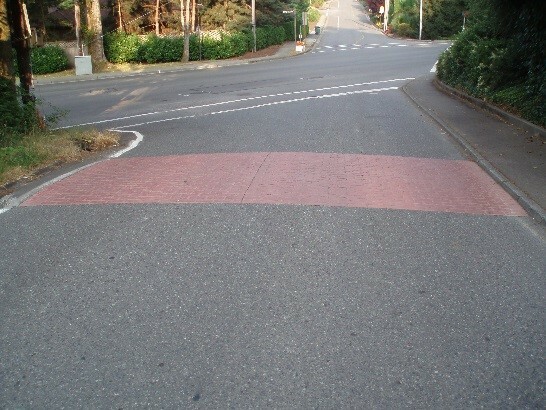 Myth: Since this part of the road is a different color and texture, it must be a crosswalk. Truth: This is called an entry treatment, and it should not be used as a crosswalk. Its purpose is to slow drivers down and in this case, the actual crosswalk slightly further ahead. Entry treatments are usually seen at the entrances and exits of neighborhoods. Myth: Once you are on the crosswalk, you do not have to worry about cars because you have the right of way. 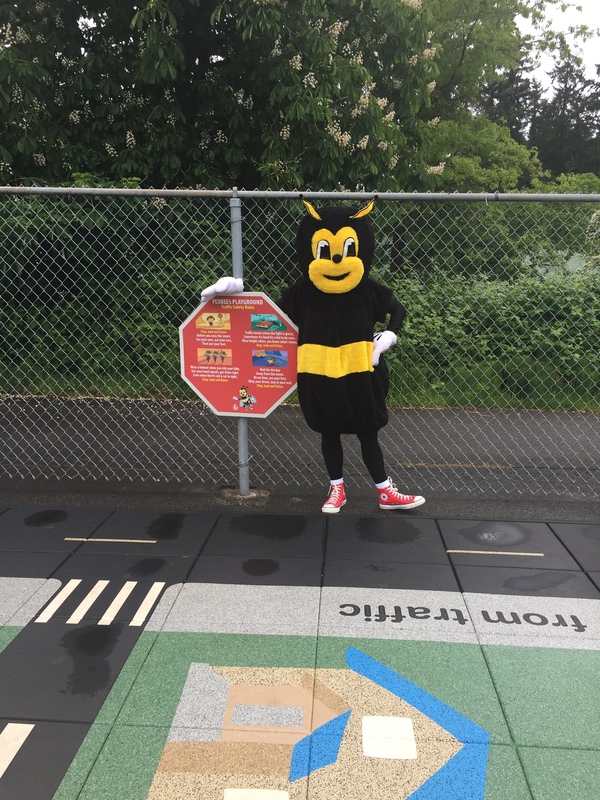 While the crossing guard and clearly displayed signage make the crosswalk safe, Pedbee and friends should still be alert crossing the street. Truth: Even though people driving are legally required to stop for people walking in a crosswalk, you should always be cautious of your surrounding area. Be on the look-out for traffic, and keep your phone in your pocket – it can wait. 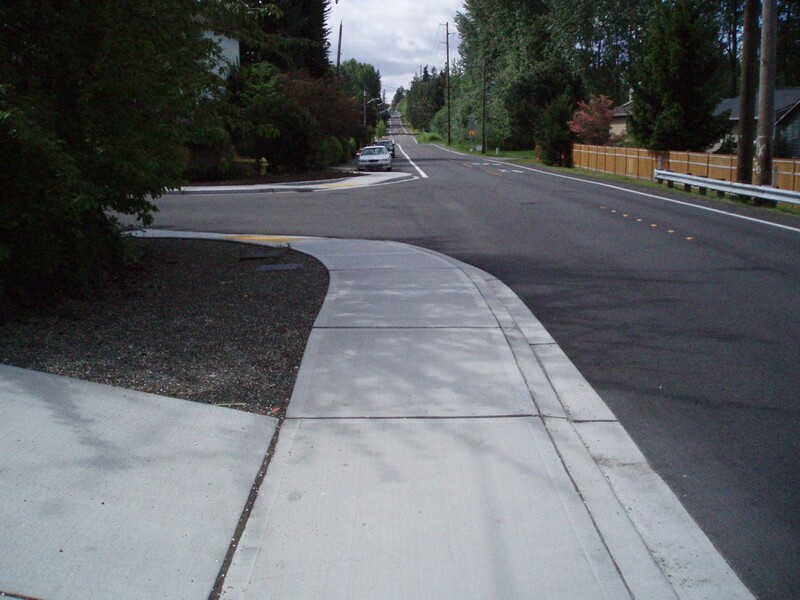 Myth: Since there is no marking on the street, there is no crosswalk up ahead. Truth: That is a crosswalk. Crosswalks can be unmarked and should be treated just like a marked one.